(?) The Arrest of Jesus, the Second Mocking of Jesus, Ecce Rex Iudaeorum. For further discussion see Harbison, 1992, p.143. Harbison, Peter, The High Crosses of Ireland: An Iconographical and Photographic Survey 1st, Habelt, Bonn (1992) High Crosses of Ireland, images, iconography, descriptions, bibliography..
Allen, J.R., Early Christian Symbolism in Great Britain and Ireland before the Thirteenth Century 1st, , London (1887) . Allen, J.R., , ‘The Celtic Brooch, and How it was worn’. In The Illustrated Archaeologist (1894) 1, 162-175. Allen, J.R., , ‘On some points of resemblance between the art of the early Sculptured stones of Scotland and of Ireland’. In Proceedings of the Society of Antiquaries of Scotland (1896/97) 31, 309-332. Allen, J.R., The Early Christian Monuments of Scotland 1st, , Edinburgh (1903) . Archdall, M., Monasticon Hibernicum: or, an history of the Abbies, Priories, and other religious houses in Ireland 1st, , Dublin (1786) . Bigger, F.J., , ‘The Dextera Dei sculptured on the High Crosses of Ireland’. In Proceedings of the Royal Irish Academy (1900) 22, 79-84. Brandt-Forster, B., Das Irische Hochkreuz. Ursprung -Entwicklung - Gestalt 1st, , Stuttgart (1978) . Brash, R.R., , ‘The Sculptured Crosses of Ireland, what we learn from them’. In Journal of the Royal Society of Antiquaries of Ireland (1872/74) 12, 98-112. Champneys, A.C., Irish Ecclesiastical Architecture 1st, , London (1910) . Crawford, H.S., , ‘A Descriptive List of Early Irish Crosses’. In Journal of the Royal Society of Antiquaries of Ireland (1907) 37, 187-239. Cullen, L.M., The High Crosses of Ireland and the Book of Kells 1st, , Dublin (c.1905) . De Paor, M., De Paor, L., Early Christian Ireland 1st, , London (1958) . De Paor, L., , ‘Monasterboice’. In The Archaeological Journal (1960) 117, 187. De Paor, M., , ‘The Viking Impact’. In Treasures of Early Irish Art 1500 B.C. to 1500 A.D. (1977) 144-152. Cone, P., Treasures of Early Irish Art 1500 B.C. to 1500 A.D. 1st, , New York (1977) . Wyndham Quin, E.R., Notes on Irish Architecture II (ed. M. Stokes) 1st, G. Bell, London (1877) . Eberhart, I., , ‘The High Cross. An Art in Human Terms’. In The Arts in Ireland (1973) 2:1, 54-59. Edwards, Nancy, , ‘An Early Group of Crosses from the Kingdom of Ossory’. In Journal of the Royal Society of Antiquaries of Ireland (1983) 113, 5-46. Fennell, W.J., , ‘Muiredach's High Cross at Monasterboice’. In Belfast Municipal Art Gallery and Museum, Quarterly Notes (1909) 13, 11-14. Garstin, J.R., , ‘Some inscriptions in Irish in the county of Louth’. In Journal of the County Louth Archaeological Society (1921) 5, 3-12. Gougaud, L., , ‘The Earliest Irish Representations of the Crucifixion’. In Journal of the Royal Society of Antiquaries of Ireland (1920) 50, 128-139. Gsanger, H., Irland, Insel des Abel, die Irischen Hochkreuz 1st, , Freiburg i. Br. (1972) . Guest, E.M., , ‘Irish Sheela-na-Gigs in 1935’. In Journal of the Royal Society of Antiquaries of Ireland (1936) 66, 107-129. Harbison, Peter, , ‘Animals in Irish Art - 2. Animals with interlocking necks’. In The Arts in Ireland (1974) 2:4, 54-63. Harbison, Peter, , ‘On some possible sources of Irish High Cross Decoration’. In Festschrift zum 50jahrigen Bestehen des Vorgeschichtlichen Seminars Marburg. Marburger Studien zur vor- und Frühgeschichte (1977) 1, 283-297. Frey, O.-H., Festschrift zum 50jahrigen Bestehen des Vorgeschichtlichen Seminars Marburg. Marburger Studien zur vor- und Frühgeschichte I 1st, , Gladenbach (1977) . Harbison, Peter, , ‘The Inscriptions on the Cross of the Scriptures at Clonmacnois, County Offaly’. In Proceedings of the Royal Irish Academy (1979) 79 C, 177-188. Haseloff, G., , ‘Irland’. In Propylaen Kunstgeschichte (1979) Supplementband 4, 223-243. Roth, H., Propylaen Kunstgeschichte, Supplementband IV 1st, , Berlin (1979) . Healy, J., , ‘'The Baptism of our Lord', as represented at Kells and Monasterboice’. In Journal of the Royal Society of Antiquaries of Ireland (1893) 23, 1-6. Henry, F., , ‘Les origines de l'iconographie irlandaise’. In Revue Archéologique, 5th ser. (1930) 32, 89-109. Henry, F., La Sculpture irlandaise pendant les douze premiers siècles de l'ère chrétienne 1stst, , Paris (1933) . Henry, F., Irish Art in the Early Christian Period 1st, , London (1940) . Henry, F., , ‘Remarks on the Decoration of three Irish Psalters’. In Proceedings of the Royal Irish Academy (1960) 61 C, 23-40. Henry, F., Irish High Crosses 1st, , Dublin (1964) . Henry, F., , ‘The Book and its Decoration’. In The Book of Kells, reproductions from the Manuscript in Trinity College, Dublin (1974) 147-226. Henry, F., , ‘Around an Inscription: The Cross of the Scriptures at Clonmacnois’. In Journal of the Royal Society of Antiquaries of Ireland (1980) 110, 36-46. Hunt, J., , ‘The Cross of Muiredach, Monasterboice’. In Journal of the Royal Society of Antiquaries of Ireland (1951) 81, 44-47. Johnstone, P., , ‘The Bantry Boat’. In Antiquity (1964) 38, 277-284. Keane, M., The Towers and Temples of Ancient Ireland 1st, , Dublin (1867) . Leask, H.G., , ‘Irish Architecture and Sculpture during the Early Christian Epoch’. In Christian Art in Ancient Ireland (1941) 2, 77-86. Raftery, J., Christian Art in Ancient Ireland 2 1st, , Dublin (1941) . Lowry, D.E., , ‘The Great Cross of Muiredach at Monasterboice’. In The Irish Naturalist's Journal (1929) 2, 242-245. Lucas, A.T., , ‘The West Cross, Monasterboice: a note and a suggestion’. In Journal of the County Louth Archaeological Society (1951) 12:3, 123-125. Lucas, A.T., Treasures of Ireland. Irish Pagan and Early Christian Art 1st, , Dublin (1973) . MacAlister, R.A.S., Muiredach, Abbot of Monasterboice 890-923 A.D., His Life and Suroundings 1st, , Dublin (1914) . MacAlister, R.A.S., The Archaeology of Ireland 1st, , London (1928) . MacAlister, R.A.S., , ‘Monasterboice’. In The Archaeological Journal (1931) 88, 354-357. MacAlister, R.A.S., , ‘The Panel representing the Tradition Evangelli on the Cross of Muiredach at Monasterboice’. In Journal of the Royal Society of Antiquaries of Ireland (1932) 62, 15-18. MacAlister, R.A.S., , ‘The Ancient Inscriptions of Kells’. In Journal of the Royal Society of Antiquaries of Ireland (1934) 64, 16-21. MacAlister, R.A.S., Monasterboice, Co. Louth 1st, , Dundalk (1946) . MacAlister, R.A.S., Corpus Inscriptionum Insularum Celticarum II 1st, , Dublin (1949) . Mason, T.H., , ‘The Devil as depicted on Irish High Crosses’. In Journal of the Royal Society of Antiquaries of Ireland (1942) 72, 131-135. Morris, H., , ‘The Muiredach Cross at Monasterboice. 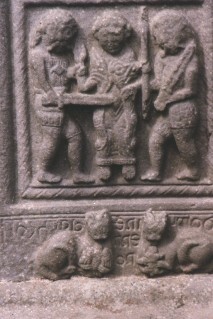 A new interpretation of three of its panels’. In Journal of the Royal Society of Antiquaries of Ireland (1934) 64, 203-212. Multhaupt, H., Glaubensspuren, Meditationen zu Irischen Hochkreuzen 1st, , Regensburg (1980) . Ó Murchadha, D., , ‘Stone Sculpture in Pre-Norman Ireland’. In The Capuchin Annual 1969 (1969) 172-200. O'Neill, H., Illustrations of the most interesting of the Sculptured Crosses of Ancient Ireland 1st, , London (1857) . Ó Sabhaios, C., , ‘Irish Crosses and a Hunger Cloth from Haiti’. In Monastic Studies (1983) 14, 51-62. Petrie, G., , ‘The Ecclesiastical Architecture of Ireland, anterior to the Anglo-Norman Invasion; comprising an essay on the origin and uses of the Round Towers of Ireland’. In Transactions Royal Irish Academy (1845) 20, 1-521. Petrie, G., Christian Insciptions in the Irish Language II (ed. M. Stokes) 1st, , Dublin (1878) . Porter, A.K., Spanish Romanesque Sculpture I-II 1st, , Firenze/Paris (1928) . Porter, A.K., , ‘An Egyptian Legend in Ireland’. In Marburger Jahrbuch für Kunstwissenschaft (1929) 5, 25-38. Porter, A.K., The Crosses and Culture of Ireland 1st, , New Haven (1931) . Raftery, J., Christian Art in Ancient Ireland II 1st, , Dublin (1941) . Raftery, J., , ‘Early Christian Cross from Monasterboice’. In Journal of the County Louth Archaeological Society (1970) 17, 2, 112-113. Raftery, J., , ‘National Museum of Ireland, Archaeological Acquisitions in the year 1970’. In Journal of the Royal Society of Antiquaries of Ireland (1973) 103, 117-213. Richardson, H., , ‘The Concept of the High Cross’. In Irland und Europa, Die Kirche im Frühmittelalter - Ireland and Europe. The Early Church (1984) 127-134. Ní Chatháin, P. Richter, M., Irland und Europa, Die Kirche im Frühmittelalter - Ireland and Europe. The Early Church 1st, , Stuttgart (1984) . Rivoira, G.T., Lombardic Architecture II 2, , Oxford (1933) . Roe, H.M., , ‘An Interpretation of certain symbolic sculptures of Early Christian Ireland’. In Journal of the Royal Society of Antiquaries of Ireland (1945) 75, 1-23. Roe, H.M., , ‘The 'David Cycle' in Early Irish Art’. In Journal of the Royal Society of Antiquaries of Ireland (1949) 79, 39-59. Roe, H.M., , ‘The High Crosses of Co. Louth. A Photographic Survey with notes on the Monuments’. In Seanchas Ardmhacha (1954) 1:1, 101-114. Roe, H.M., , ‘Muiredach's Cross, Monasterboice’. In Ireland of the Welcomes (1963) 2:5 Jan-Feb, 17-21. Roe, H.M., , ‘Ireland and the Archangel Michael’. In Millénaire Monastique du mont Saint-Michel III. Culte de Saint Michel ed Pelerinages au mont (1971) 481-487. Roe, H.M., , ‘The cult of St. Michael in Ireland’. In Folk and Farm, Essays in Honour of A.T. Lucas (1976) 251-264. Ó Danachair, C., Folk and Farm. Essays in Honour of A.T. Lucas 1st, , Dublin (1976) . Roe, H.M., Monasterboice and its Monuments 1st, County Louth Archaeological and Historical Society, Louth (1981) . Schiller, G., Ikonographie der Christlichen Kunst II. Die Passion Jesu Christi 1st, , Gutersloh (1968) . Schiller, G., Iconography of Christian Art II. The Passion of Jesus Christ 1st, , London (1972) . Sexton, E.H.L., A Descriptive and Bibliographical List of Irish Figure Sculptures of the Early Christian Period 1st, , Portland (1946) . Smith, J.H., , ‘Ancient Stone Crosses in Ireland’. In Ulster Journal of Archaeology (1853) 1, 53-57. Smyth, A.P., Scandinavian York and Dublin. The history and archaeology of two related Viking Kingdoms II 1st, , New Jersey/Dublin (1979) . Stephens, F.E., , ‘The Tall Cross at Monasterboice’. In Journal of the Royal Society of Antiquaries of Ireland (1913) 43, 267. Stokes, M., , ‘Early Christian Art in Ireland. Bas-Relief on Cross at Monasterboice’. In The Reliquary and Illustrated Archaeologist (1899) 110-115. Stokes, M., , ‘Christian Iconography in Ireland’. In The Archaeological Journal (1900) 57, 270-286. Stokes, M., Early Christian Art in Ireland 2, , Dublin (1911) . Stone, L., Sculpture in Britain. The Middle Ages 1st, , Harmondsworth (1955) . Streit, J., Sonne und Kreuz. Irland zwischen Megalithkultur und frühem Christentum 1st, , Stuttgart (1977) . Ullrich, H., , ‘Irische Hochkreuze als zeugen Nordischer Frommigkeit’. In Kunst und Kirche (1939) 16, 112-116. Visser, G., Voskuilen, A., Zandstra, W., Die Ierse Kruisigingsikonografie van de 7de tot de 13de eeuw. I Tekst; II Catalogus 1st, , Utrecht (1981) . Walcha, G., Beitrage zur Bandgeflecht - Ornamentik in Schottland. 10. Veroffentl. D. Abteilung Architektur des Kunsthist 1st, Inst. D. Univ. Koln, Koln (1976) . Weir, A., , ‘Three Carved Figures in County Louth’. In Journal of the County Louth Archaeological Society (1977) 19, 1, 67-73. Weir, A., Early Ireland. A Field Guide 1st, , Belfast (1980) . W., V., , ‘Irish Cross’. In Bulletin of the Metropolitan Museum of Art (1908) 3, 228. Calvert, J.A., The Early Development of Irish High Crosses and their relationship to Scottish Sculpture in the ninth and tenth centuries , University of California, Berkeley (1978) Ph.D., .